The New England Conference on Mithraic Studies is an informal research convention for people interested in the study of the god Mithras, whose popularity reached its height among the Roman legions in about 100 to 400 CE. Convention highlights include the chance to do research in Yale’s world-class libraries and to tour the Yale University Art Gallery, which houses the Dura Europos mithraeum. Friday evening we will dine at the Kumal Indian Restaurant, Howe St (203) 498-2801, which is within easy walking distance of the hotel. Saturday night will be a potluck Roman feast in the con suite. Mithraism touches on many aspects of ancient history — early Christianity, mystery religions, philosophy, astrology, symbolism, the Roman provincial system, Zoroastrianism, and more. People attending MithraCon bring their individual research interests and ideas, and get a chance to try those ideas out on others and discover new ways of looking at ancient history. There is a “Roman feast” in the conference suite on Saturday evening, and during that time participants share presentations and discussion on a wide variety of topics. As the name MithraCon indicates, it’s not all serious scholarship. Discussions are often lively and interesting. There are side trips to the bookstores of New Haven. Many participants bring their own wares to sell (everything from spices to books to art to ancient artifacts). To attend the conference you need to do two things: Register for the conference AND register at the hotel. Since this is a small specialist convention, we sleep in the con suite; the men in one room and the ladies in the other. Or you could book your own room for privacy. We will have a refrigerator and microwave in the con suite. Registration: $50 until March 20th (must be received on that date), and $60 at the door. Con registration and checks should go to Dr. Jane T. Sibley, PO Box 123, Haddam, CT 06438. If you have questions, please email me at jrsibley@snet.net. There is free wireless internet in all rooms. Yay! — Conference dress is casual, though some people bring a nicer outfit for dining out. New Haven in April can be chilly and windy, so be prepared. — Bring $20 for your Yale library stacks pass (good for a week!) plus money for meals, photocopying and any shopping you may wish to do (including purchases from fellow conferees). To make the most of your time at the library, it may be worthwhile to search its catalog beforehand and make notes of books you want to find. You can search books in the Orbis catalog, (see link at right) and have books shelved in the more remote Yale libraries delivered to to the main library so they’re waiting for you when the convention arrives! — Bring materials for any presentations you may wish to give to the group. Presentations are not required, but are a good way to test works in progress, start discussions on subjects of interest, and inform and delight your fellow participants. Presentations should be no more than 30 minutes. – Merchant goods if you wish to sell to fellow conferees. Merchant space is free and will be secured during non-conference times so that merchants need not choose between participating and guarding their products. The conference is held at the Courtyard Marriott, which provides a conference room and comfortable accommodations. The hotel is near a shopping district and a very short walk from Yale University itself. Directions: I-91 S to Exit 47 (Downtown New Haven), then take 3rd (and last) exit (Right), which puts you on York Street. Drive through the George, Crown, & Chapel Street lights, and turn Left at Broadway; on the far left corner is Au Bon Pain. Keep to the Left; you will see the hotel to the left. Public transportation from the Boston or New York areas: take the train to New Haven’s Union Station; there will be plenty of cabs there who will be more than willing to shlep you and your gear the mile and a half or so to the hotel, which is almost on the Yale campus. Check in is 3 p.m., but if you get there earlier, you can leave your stuff with the front desk, and then maybe meander across the street to the huge Barnes & Noble bookstore or some of the other shops. Bus service to New Haven is also an option. If you need to call a cab, the number is (203) 777-7777. Conference participants have on occasion used free time to wander through new and used bookstores or explore the non-Mithraic wonders of Yale’s world-class Art Gallery including the newly reopened Dura-Europos Mithraeum, a genuine temple of Mithras brought from Syria decades ago. when I look at my life story I realise with some difference , unwillingly I am Mithraism . apparently I live among the people but no one can understand me , even my family . the top of this page is written what is the use of that ? First of all I would like to congratulate you for your website, it seems really accurate, and that’s not easy to find regarding the mithraic studies… I would also like to make you a question: Which university (english spoken) you think it would be more appropriate for someone willing to investigate deeply about the mithraism? I’m greatly looking forward to MithraCon 2016! This is always a fun event and I’ve already got a long list of research topics for the library visit. I’m especially looking forward to visiting the Yale University Museum, the deities represented in the artifacts from Dura Europos are the same deities who’s temples have been destroyed at Palmyra. I notice that there is a question about where to study Mithraism that has gone unanswered here. Honestly I have never heard of any university that has offered a good path to Mithraic study. I’ve been quite impressed with Yale as it has a world class library, AND the remains of a Mithraeum present in the city… but I’m sure other sites in say, England and Europe would be able to offer similar resources. MithraCon 2016 was a great conference! Folks got together at the Courtyard Mariott at Yale on Friday, and after some initial discussion we had dinner at the Kamal Indian Restaurant in honor of Mithra’s Indo-European roots. On Saturday there was more in-room discussion, and then we had breakfast at Patricia’s Restaurant (close to the hotel) and then visited the Yale University Book store before getting to Sterling Library at 11. Research went on from 11 until the library close at 4:45. The new “book scanning” facilities at the library are extremely useful… one can scan articles or even entire books to USB or Email. It really is a wonderful way to get resources for later research and work! Saturday Evening a Roman Feast was held in the conference room, with presentations and historical discussion that lasted until midnight. On Sunday we again had breakfast at Patricia’s and then went to the Yale Art Gallery when it opened at 11. It is truly amazing to get to visit a partial reconstruction of a Mithraeum… the only one in North America. The setup there is wonderful, allowing for both close study and discussion… and even semi private contemplation as the room is not particularly high traffic. Very much looking forward to MithraCon 2017, which will be later in the month, April 21 to 23. The convention will be starting on the Birthday of Rome this next year so it should be particularly celebratory! Haha wow, I love this man. PLEASE keep posting! Can’t wait to read your next blog! The restaurant is no longer the Kamal Indian Restaurant; last year we went there and, as I recall, it was now Afghani. Delicious food prepared by a family which really knows how to cook. Since alcohol isn’t served there, BYOB. If you cruise on Orbis for books at the library, some material is in off-campus storage or in another of Yale’s plentiful libraries. So call the Privileges Office (203) 432-1775 at least 4 days ahead of Saturday (i.e. by Tues April 9th) to pay for your stacks pass. You will get a VIS (visitor) number, which you can use to order books from off campus storage or from many (but not all) of Yale’s libraries. Then, when we arrive at the library on Saturday morning, the actual card (and your photo taken) will be made, and you can collect the ordered books from Circulation. 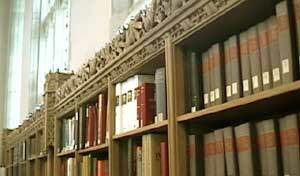 Then you can ramble through one honkin’ great library, as well as the microfilm archives in the basement. As I recall, the stacks card costs $20, and oh boy, is it worth it! Be sure to bring a thumb drive or 2; you will fill them…. Note that there is sleeping space for 3 people in the main room, and 2 in the adjoining room. It’s a really really small convention. If we get more people, I will try to bring some air mattresses; BYO sleeping bags. Or you can book your own hotel room. For the Roman potluck feast, I will start an email discussion with attendees as to who brings what. So far, I plan to bring a jug of Paisano wine and maybe a couple of rotisserie chickens. © New England Conference on Mithraic Studies. Powered by WordPress & WPstart Theme.